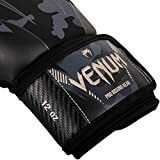 Venum Impact boxing gloves : knock them all out. 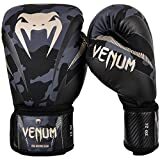 The Venum Impact boxing gloves are the real deal : these authentic weapons of mass destruction will help you to crush all your opponents. 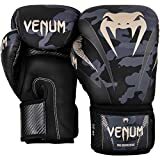 Train harder thanks to their triple density foam, specially designed to protect to protect your hands with fully attached thumbs to avoid injuries. Spare always more : the long cuffs are improving your wrist protection while the palm mesh panel keep your hand cool. Fight relentlessly and hit with all your power. And let every opponents fall on the floor. TECHNICAL FEATURES Premium PU. Triple density foam for a better absorption. Renforced palm. Full attached thumbs to provide a better protection. 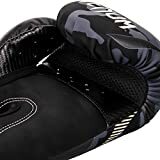 Reinforced seams. Large Velcro enclosure with strap. Longer cuffs. Logo Venum. Three colours (Grey/Black, Black/White, Dark Camo/Sand).